Once an assessment has been published, students must be activated if it is to be taken online. There are 2 ways to activate an assessment, with a 4-Digit PIN number for added security, or without a PIN. This document reviews how to activate an assessment with a PIN. Please refer to the Help Document, Activating an Assessments Without a 4-Digit PIN, to learn how to activate students without a PIN Number. On the Manage Assessments page, find the assessment to administer, and select the bolded Online Admin icon (computer monitor) (1b). Note that all students have a vertical gray bar to the left of their ID numbers and are shown as Inactive in the column, Status of Items Attempted, also color-coded gray. Once activated, the gray bar next to each active student’s name will change to purple as indicated in the color-coding key, along with the PIN. Active, also in purple, will show in the column, Status of Items Attempted. Students are active, but have not yet started to view or answer any of the items in the Student Portal. 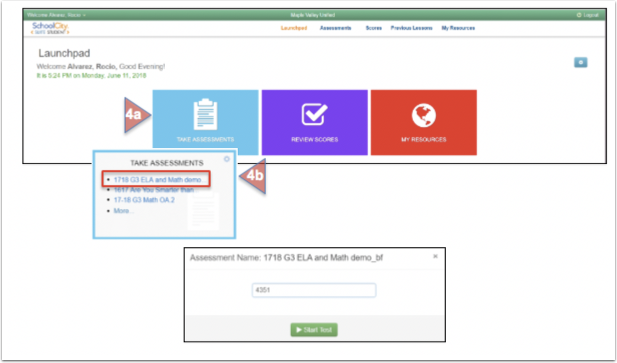 Click on the TAKE ASSESSMENTS Flip Card to reveal the list of activated assessments. Select the assigned assessment, enter the PIN, and click on Start Test. Or, from the Top Menu Bar, click on Assessments. Select the assigned assessment, click on Start, enter the PIN, and click on Start Test.